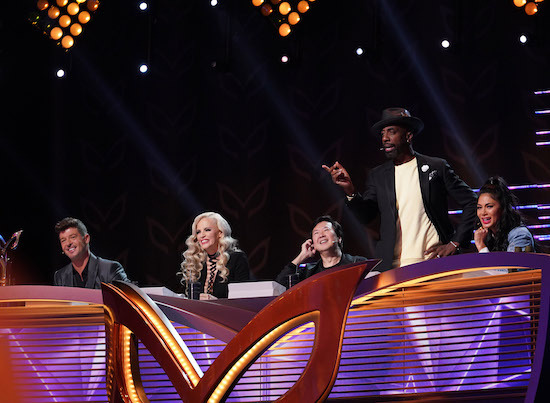 THE MASKED SINGER: L-R: Panelists: Robin Thicke, Jenny McCarthy, Ken Jeong, guest panelist J. B. Smoove and panelist Nicole Scherzinger in the “All Together Now” episode of THE MASKED SINGER airing Wednesday, Feb. 13 (9:00-10:00 PM ET/PT) on FOX. Cr: Michael Becker / FOX. Tags: La Toya Jackson, LaToya Jackson, Who is the Alien on The Masked Singer, Who was the Alien on the Masked Singer, Who was unmasked on The Masked Singer on February 13?, Who was unmasked on The Masked Singer on Wednesday February 13?, Who was unmasked on The Masked Singer?